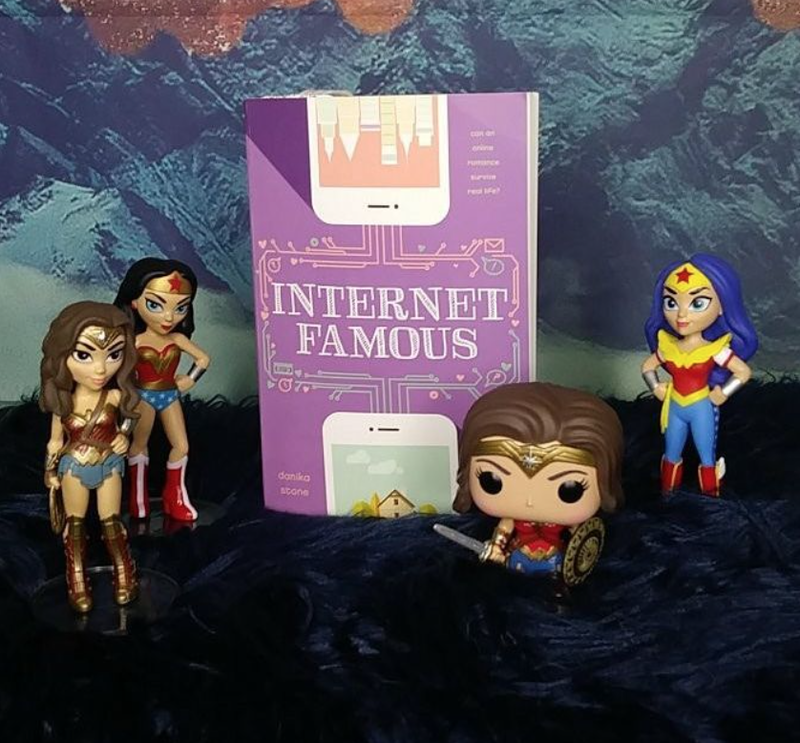 Hey fellow book lovers and bloggers💻 of the world, Today’s book blog is about Internet Famous by Danika Stone📚. Danika’s young adult Contemporaries have become some of my favorite books of late. Internet Famous is her second YA book in the world of Star Veil fandom, and I did purchase this book on June 5th and it came out on June 6. This book was also published by one of my favorite’s companies of late which are Swoon Reads. So let's get to the summary and then my thoughts💭💭. So this book is about Madi Nakama 👧 who is an online blogger💻 and creator of Madlibs. Madlibs is a site where Madi, watches old movies📺 and blogs about them. She does something similar to what I am doing with this blog but she is using old movies. But Madi's blog is bigger and one day she decides to do something like a meetup. A meetup is where she meets up with some of her fellow blogger subs. She was convinced to do this meet up by a boy named Laurent who she thought was a girl name, Lauren📞📞. As time goes on She and Laurent start to feel things for each other💑. After this meetup, Madi also notices a troll on her blog👹. She does everything to be rid of the troll but nothing seems to be working. But on top of it all, Madi has a sister who is Autistic. Everyday Madi has to help her sister keep up on a routine and She also has to deal with her parents. All the while she is expected to be a perfect student while dealing with this crazy life. Blogging is her one way out of dealing with a hard life but in the meantime, the troll seems to be out for blood. The troll continues to do everything to ruin Madi’s life and all that she has worked hard for, plus her new relationship with Laurent. Now in order to find out the rest, you need to go buy the book. I promise this ending is so worth buying the book. So now onto my final thoughts of the book. I gave this book a rating of 4.5 stars out of 5 stars💫💫💫💫. I can’t wait to read more of Danika’s work, especially her YA work. She did an amazing job on discussing online trolling and how it can affect people’s real lives. The online trolling aspect felt so real to me and I love that. I have personally had to deal with Trolls, who simply hate me for having an opinion. But I am so glad that my trolling experiences never become as bad as Madi’s. Danika also did an amazing job discussing Sarah’s Special needs(Sarah is Madi's Sister). She also did a great job with portraying Madi's relationship with Sarah and her parents. Madi had to grow up before her time and become a parent and that's incredibly hard to do. This particular part of the story really called to me, because a number of women in my family had to do something similar. These women step up to raise children that were not theirs because of death and hardship. So I especially commend Danika for describing this part of the story. Although I will say I am extremely happy with the end of this book. This book just describes and takes you through so many great real-life issues that can be hard for the normal person to deal with let alone teenagers. I just can’t say enough about how much I love this book. Plus the romance was great too💏💏💏. The romantic part of the story was a sweet and adorable thing in the midst of all of the very adult subjects. Great book, great characters, and a great ending. You won’t regret picking up this book and reading it. I really hope you do pick up this book, it's a great story. As always the links are listed below for the author, the book, and my social media.